A comprehensive step by step tutorial on building CRUD (Create, Read, Update, Delete) Hybrid Mobile Apps using Ionic 4, Angular 7 and Cordova. The Angular 7 just released a few weeks ago and Ionic 4 still in beta version. So, we are an experiment using both frameworks as a hybrid Mobile Apps. For the backend, we are using our existing Node, Express.js, and MongoDB RESTful API. There are little new features in Angular 7, but we just take a bit for this tutorial. You will see the Angular version still using 6 in the `package.json`. Next, we have to upgrade the angular version to 7. You can replace all dependencies in `package.json` with this. 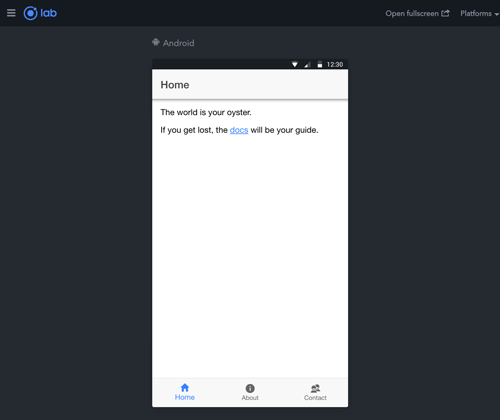 Now, open the browser and you will the Ionic 4 and Angular 7 app with the iOS, Android, or Windows view. If you see a normal Ionic 4 tabs application, that's mean the Angular upgrade process is successful. To install Angular 7 Material and CDK, simply run this command. Type enter or yes for every question that showed up. Next, register all required Angular Material components or modules to `app.module.ts`. Open and edit that file then add this imports. We will put every CRUD pages inside tabs that previously created as default Ionic 4 starter template. We will display a list of data inside home page, so for edit, add and details we will modify the existing page or tab items. Rename contact page folder, files and it's filed contents as `add`. Rename about page folder, files and it's filed contents as `edit`. Type this command to generate a new details page. Next, open and edit `src/app/tabs/tabs.router.module.ts` then replace and add this imports. Change the route constant as below. Next, open and edit `src/app/tabs/tabs.module.ts` then add or replace this imports. Add those imported modules to the `@NgModule` imports array. Next, open and edit `src/app/tabs/tabs.page.html` then replace all HTML tags with this. To display list of data, open and edit `src/app/home/home.page.ts` then add/replace this imports. Next, add the constructor then inject those modules to the constructor. Remove all default generated variable, function and constructor body if exists then add this variable before the constructor for hold classroom data that get from the service. Add function for getting Product list from API. Add Angular 7 init function after the constructor for call above function. Add function for the new Angular 7 CDK Drag&Drop. Next, because we will use the new Angular 7 CDK features. We should add modules for it to `src/app/home/home.module.ts` then add this imports. Register to `@NgModule` imports array. Next, open and edit `src/app/home/home.page.html` then replace all HTML tags with this. Every time you click the list item in the List of data, you will be redirect to Details tab including the ID of the selected data. Open and edit `src/app/details/` then add/replace this imports. Add a variable before the constructor for hold Product data. Add an asynchronous function to getting Product detail from API. Add an asynchronous function for display an alert. Call get product function from Angular 7 init function. Add the functions to delete the data. Next, open and edit `src/app/details/details.page.html` then replace all HTML tags with this. We will use Angular 7 Reactive Forms for edit data. Open and edit `src/app/edit/edit.module.ts` then add/replace this imports. Register the Reactive Form Module to the `@NgModule` imports array. Next, open and edit `src/app/edit/edit.page.ts` then add/replace this imports. Add this constructor and inject above modules. Add the variables for hold current data, Form Group and Reactive Form controls. Add asynchronous function to get Product Detail. Call that function inside Angular 7 init. Add asynchronous function for handle form submit. Add asynchronous function to display an alert that calls on the first function. Next, open and edit `src/app/edit/edit.page.html` then replace all HTML tags with this. Almost same with edit data, we will create a form for add new data. Open and edit `src/app/add/add.module.ts` then add/replace this imports. Before running the Ionic 4 and Angular 7 application, first, you have run the Node.js, Express.js and MongoDB RESTful API that previously downloaded. Type this commands in another terminal tab. We assume, you already running the MongoDB server. Now, we have to run the whole Ionic 4 and Angular 7 application to the browser first by type this command. You can navigate the whole application, so it will similar like this. To run on the devices, type this commands. That it's, the results of our experiment of using Angular 7 with Ionic 4 beta. To get the full working source code, you can get from our GitHub.